Monday I woke up, and began my morning ritual. I took a shower, shaved, got dressed, had a little breakfast, went back in to the bathroom to brush my teeth. When I went to rinse my mouth I realized that there was a problem. As soon as the cold water hit my teeth it was like someone stabbed me in the gums. I called the dentist, told them that I had a sharp pain way back in my last molar, typically a very difficult area to see or reach with flossing and brushing alone. Much to my horror they told me that they were booked till Friday. All week I tried to eat and drink out of the right side of my mouth and all week I experienced the pain that something is just not right. I would eat something cold and it would touch that tiny sensitive spot and it would stop me in my tracks. When Friday finally came around and I got to the dentist he was quickly able to see the problem. He told me that I had a small cavity in a really bad spot, but not to worry he could fix it in no time, he leaned my chair back and told me to open up. That’s when I saw that he was wearing a blindfold and holding in his hand a Craftsman Professional 14.4 volt Cordless Drill/Driver with dual gear ranges, a 24-position adjustable torque clutch with 1/2 in. single sleeve keyless chuck, an automatic braking switch, and a bubble level on top. The handyman that I am, I instantly recognized that this was indeed a very nice drill for someone in the carpentry world, but absolutely the wrong tool in every way for this particular job. Micro-Polishing is a high detail mold finishing process. Using an ultrasonic polishing machine while looking through the lenses of a high powered stereo microscope. This process allows the user the ability to see up to 18x more detail in your cores, cavities, pins, and any other surface being treated. Now that I have given you a simple definition of what Micro-polishing is, lets dissect it a bit further and look at the different parts that make this one of the most important new processes being offered to the industry. The first thing that we need to talk about is the importance of ultrasonic polishing. This process, which has been around since the late 1970’s, works by generating high-frequency (ultrasonic) waves, which are then transformed through the hand piece to create an extremely fast longitudinal reciprocation rate of 25,000 strokes per second of an abrasive tool. This coupled with the ability to control the stroke length form 4 to as little as 40 microns through the power output selector, allows for the most intricate and detailed polishing available to date. Ultrasonic polishing machines require the use of abrasives tools made from materials that are hard and strong in nature such as; plated diamond, solid diamond, abrasive stones, ceramic stones, as well as brass and wood laps. This strength requirement allows the user to apply more pressure to the job increasing the cutting action. These abrasive tools are also easily shaped to conform to the part or work surfaces allowing for a more precise finish. This process is an extremely powerful, aggressive and controlled method of polishing allowing the mold finishing professional a distinct advantages over traditional practices such as off hand or mechanical polishing. Ultrasonic polishing makes it possible for the operator to move the tool back and forth in a profiler at a rate of 25,000 strokes per second with the ability to set the stroke length between 4-40 microns. There is absolutely no other way to achieve the desired results on the most complex, highly detailed, close-tolerance jobs. Over the years the main downfall to the ultrasonic polishing process was the fact that the user couldn’t actually see what they were doing, therefore they were unsure of the amount of stock being removed, not to mention you couldn’t be sure that you were in the exact right area. Like the blindfolded dentist, you had to trust your sense of judgment and hope to feel your way through the process. This combined with the fact that ultrasonic polishing is a very aggressive method of mold finishing allows for the potential to remove too much material possibly creating new problems on the most critical jobs. Going back to our dentist analogy, you have now turned a simple filling into a full-blown root canal, and no one likes that. With micro polishing the blindfold is removed, and in its place a high-powered stereomicroscope has been added. In the past you could only fine tune your settings and hope you were succeeding. Now with the microscope in place the polisher has the ability to focus directly onto the area that they wish to work on and see exactly what they are doing. Micro polishing for the first time ever absolutely takes the guesswork out of the polishing process, and in its place leaves confidence and precision craftsmanship that until now was unachievable. This is not to say that micro polishing is a cure all for every polishing job out there and that anyone can achieve these types of results. This process is most beneficial for close tolerance intricate work, dealing with complex configurations and should only be attempted by a trained professional. 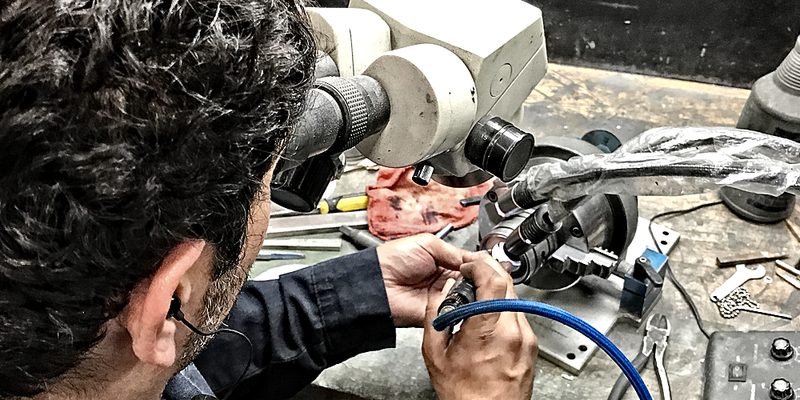 A strong understanding of the job at hand, the ultrasonic machine and the polishing process is still an extremely important piece of the puzzle. Remember, just because you have the best tools, that doesn’t mean you can necessarily do the job. I would take a trained dentist with the 14-volt Craftsman over my neighbor the accountant with a full arsenal of the best dental equipment on the market any day.